MONTREAL– The 2013 “Fighter of the Year,” according to The Ring Magazine and many other boxing publications, as well as the recipient of the prestigious “KO of the Year” award, Adonis “Superman” Stevenson ( 23-1-0, 20 KOs ) returns to the ring May 24 at Bell Centre in Montreal to defend his World Boxing Council (WBC), The Ring and lineal light heavyweight titles for the third time against challenger Andrzej Fonfara (25-2-0, 15KO ). Born in Warsaw, Poland and now fighting out of Chicago, Illinois, Fonfara is rated No. 1 by the International Boxing Federation (IBF) and World Boxing Organization (WBO), as well as No. 3 by the WBC. 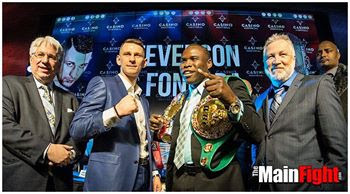 The world light heavyweight title fight between Stevenson and Fonfara headlines, “COLLISION,” which is presented by Groupe Yvon Michel (GYM), in association with Warriors Boxing, and co-presented of Mise-O-Jeu and Videotron. As previously announced this fascinating boxing event will air live in the USA on Showtime, thanks to Mr. Stephen Espinoza, its Executive Vice President & General Manager, Sports and Event Programming. Stevenson, 36, won his world light heavyweight title via knockout in only 76 seconds of then-undisputed light heavyweight champion, “Bad” Chad Dawson (31-3-0, 17 KOs). In his first title defense on September 28, 2014, the new champion was supposed to face a major test against former world champion Tavoris “Thunder” Cloud (24-1-0, 19 KOs). It was quite different, however, as the powerful left-hander pushed Cloud until he retired at the end of the seventh round, after Stevenson gave him a thorough boxing lesson. Stevenson gave a brilliant demonstration of skills, finesse, speed, defense, and power. Two months later, “Superman” completed his dream year with an unequivocal defeat of the WBC No. 1 mandatory contender from Great Britain, Tony ‘Bomber’ Bellew (20-1-1, 12 KOs), who was unable to finish the sixth round. The tough Englishman later declared that he had never been hit with such powerful shots, even by heavyweights. During his incredibly amazing run, the powerful southpaw Stevenson has knocked out all 10 of his last 10 opponents: Bellew (TKO6), Cloud ( TKO7 ), Dawson (KO1),Darnell Boone (KO6), Don George (TKO12), Noe Gonzales ( TKO2 ), Jesus Gonzales (KO1), Aaron Pryor Jr. (TKO9 ), Shujaa El Amin TKO1) and Derek Edwards (KO3). In fact, the last time a Stevenson fight went the full distance dates back to 2007. The 26-year-old Fonfara has had spectacular victories over three former world champions in his last five fights. First, by third-round technical knockout in 2012 against former WBA monarch Byron Mitchell (29-9-1, 22 KOs), followed by a 10-round decision over multiple champion Glen Johnson (51-16-2, 35 KOs), and then last year a ninth-round stoppage of former WBA title-holder Gabriel Campillo (22-5-1, 9 KOs). Other fights on the “COLLISION” card will be announced in the coming days but GYM is committed to presenting another memorable event. GYM does confirm that the IBF No. 10, WBO No. 11 and WBC No. 16 middleweight David Lemieux (31-2-0, 29 KOs) will be in the co-feature for the most important fight of his career. WBO No. 2, WBA No. 3 and WBC No. 10 world light heavyweight contender Eleider Alvarez (14-0-0, 8 KOs) will be in action May 24, along with rising light heavyweight star Artur Beterbiev (4-0-0, 4 KOs), IBF No. 7 middleweight Kevin Bizier (24-1-0, 14 KOs), heavyweight prospect Oscar Rivas (13-0-0, 8 KOs ), super middleweight Sébastien Bouchard (8-0-0, 2 KOs), and young welterweight Yves Ulysse Jr. (1-0-0, 1 KOs). Tickets go on sale this Saturday morning (Mar. 29) at 10:00 a.m. ET, at Bell Centre, online at www.evenko.ca, calling GYM at (514) 383-0666, or Boxing Club Champion(514) 376-0980 Ticket prices range from $50.00 up to $350.00 reserved on the floor.